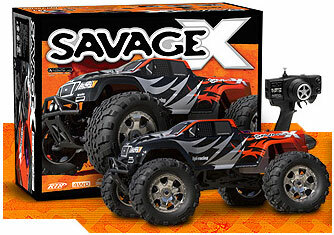 The HPI Savage RTR is an example of an all-inclusive Ready-To-Run RC Truck. When I first started out in RC, I found there was an overwhelming amount of information to learn; tuning, gearing, motor tweaking, tire compounds and inserts, etc. The experimental process took quite some time and involved a lot of money. While I was ok with this (I did see results and actually got quite good), I knew that if there was some place I could read up on all of this it would have cut the time and cost in half (at least). Sure, there were some Pro RC Drivers at the track, but they all seemed so unapproachable … I always felt like I was bothering them. Jump forward to 2001. CompetitionX started as a site that RC Drivers (from beginners to professionals) could go to and read up on any RC information they needed; an online beginner’s guide to RC cars. Are you ready to to get started? Let’s go! 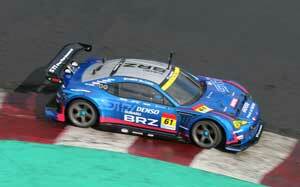 Most radio controlled onroad kits resemble full-size touring cars, similar to the ones you see on TV (BTCC, etc). Radio controlled onroad cars are typically four-weel drive (4WD), have real working independent suspension systems, realistic slick or treaded tires (of different compounds), carbon fiber, aluminum and titanium components, and can be (or upgraded to be) extremely fast! On the down side, jumping off curbs, running over speed bumps or driving through grass and dirt are usually bad for onroad cars. The suspensions are just not set up to handle this. But, if you have a large street, a vacant (paved) lot or even a good sized driveway, onroad cars can be the way to go. Offroad kits come with larger, spiked tires, beefier shocks and longer suspension components. They also come in either 2WD or 4WD. Offroad cars can go just about anywhere, including grass, dirt, off curbs, over speed bumps, up driveways and over big jumps! They can also run in the street but, because of their overall bulkiness, just don’t have the same appeal as the onroad kits, nor do they handle as well. The final choice might be something a little more for fun….RALLY! There are a few companies that make rally cars (or conversions) that are basically onroad kits with offroad suspensions, longer shocks and knobby tires. They are typically 4WD and can handle the abuse of offroad better than a dedicated onroad kit. As this opinion might be disputed by quite a few people, the majority will tell you that, while run times suffer slightly, Electric RC cars are by far easier to maintain. They are quiet and require a few simple plugs and switches to run. 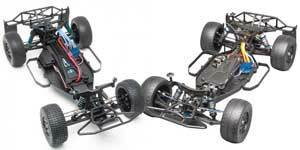 Electric RC cars can also be run indoors, while Nitro RC cars cannot. As mentioned earlier, run times can be around 6-12 minutes depending on the motor/battery combo, and take about 25 minutes to charge (newer, LiPo powered cars have been known to run for as long as 40 minutes on ONE charge!) Speeds in excess of 30-40 mph are not uncommon for most Electric RC cars. Fastest recorded Electric car has hit over 200mph! Nitro (or Gas powered) RC cars have the added benefit of being able to run ALL DAY. Tuned correctly, Nitro RC cars can hit speeds of over 60mph. Nitro RC cars also have realism … the smoke, the fumes, the sound of the exhaust … all added reasons why Nitro RC cars are so cool. 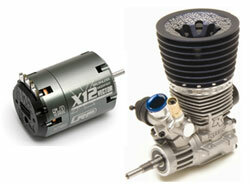 Nitro RC cars must use a specific ‘Nitro’ fuel…normal pump gas will not work (except in 1/4, 1/5 and 1/6 scale kits). RC Car Kits are simply that … a box of bagged parts! Kits are for the person that enjoys building, wants the satisfaction of a completed kit after building or the knowledge of how the vehicle REALLY works. Kits do not come with radio gear or motors. The instructions include very detailed diagrams along with some helpful text and most companies have online (or phone) support should you become confused. Typical build time is around 4-6 hours depending on how thorough you are in the building process. Take your time and you’ll be rewarded with an incredible racing machine! As mentioned earlier, RTR stands for Ready-To-Run. 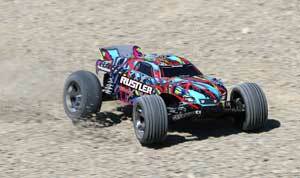 All Ready-To-Run RC cars come completely assembled from the factory, including radio gear. For Electric RTR’s, all you need to do is charge and install the battery and GO! For Nitro RTR’s, install AA’s into the transmitter and vehicle (for the onboard radio gear), fuel it up and GO! Nitro vehicles do require a short engine break-in period (instructions are usually included in the box). RTR’s are good for the person who wants to jump into Radio Control without the downtime of building. They are also great for younger kids that may not have the skills (yet) to build a vehicle.